The preparation of a soufflé can often be a dreaded moment in cooking, whether it be sweet or savory, since the mixing and cooking techniques involved are determining factors in achieving the eagerly-awaited soufflé effect. 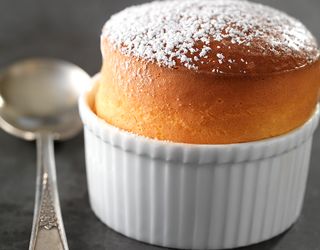 Le Cordon Bleu Chefs can teach you the required skills to realize this light, vanilla-flavored, seasonal soufflé, the perfect end to a gourmet meal. Gently fold the French meringue into the pastry cream. Prepare and fill soufflé dishes . Bake the soufflé in oven for 30 minutes. Remove from the oven and sprinkle the hot soufflés with powdered sugar. Serve immediately. This molten chocolate dessert is the ultimate in decadence to impress your loved one this Valentine’s day. Create the perfect ending to a Saint-Valentine’s Day meal with this delicate dessert which combines crisp puff pastry and smooth fromage blanc and orange cream which are perfectly complemented by the rich intense flavor of cherries. Discover this delicious, simple recipe which combines a sweet chocolate cream with the light spiciness of a cardamom Chantilly. French meringue, sorbet and Chantilly cream, are three essential culinary techniques found in this recipe. A combination of subtle flavors and varied textures from a crisp bite to melt in the mouth, this superb dessert will surprise and instantly refresh your palate. Item: Slender handle and generously spaced hoops make it easy to smooth mixtures of all consistencies.